No one would mistakenly believe that T-Mobile wants the competition to succeed, but it does tend to take things to the next level. The carrier has been very vocal about its dislike of the other guys, and today brings two more proofs of that. In anticipation of Verizon's earning call this morning, T-Mobile proposed a drinking game. The rules are simple. 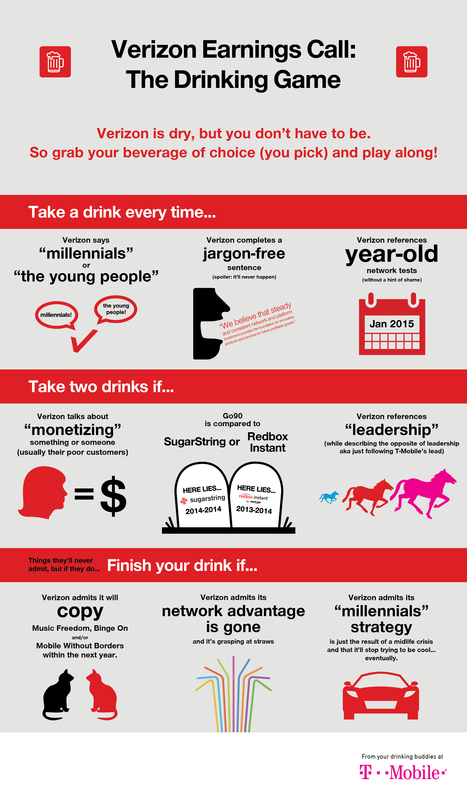 Drink whenever Verizon gets through an entire sentence without using jargon. Take two drinks if the carrier compares its Go90 video streaming service to subpar options that died a few years back. Finish your drink if the carrier completely swallows T-Mobile's smear campaign hook, line, and sinker. Is it classy? No, but you could say it's humorous. You could also say the same thing about the spoof T-Mobile has made of a recent Verizon ad. If you consider trolling funny, that is. Here's the original ad from Verizon. And here is the version from T-Mobile. If you listen close enough, you can hear CEO John Legere's voice in the back of your mind. There are things to love and hate about both carriers. Verizon's network reaches corners of the country the other guys don't compete in. T-Mobile is less restrictive about what you do with your device. The Un-carrier also offers unlimited data, but in large swathes of the country, that amounts to an unlimited amount of nothing. It's easy to troll in both directions. We're sure you'll take sides in the comments.